My first trip ever to Washington D.C. was finally happening. I had been waiting months for this opportunity to cover the legendary, iconic and perfectly photogenic metropolis. Yet, not only was my camera going to get work, but so would my heart. See, this trip was more about the passengers than the destination, and I would soon find out why. 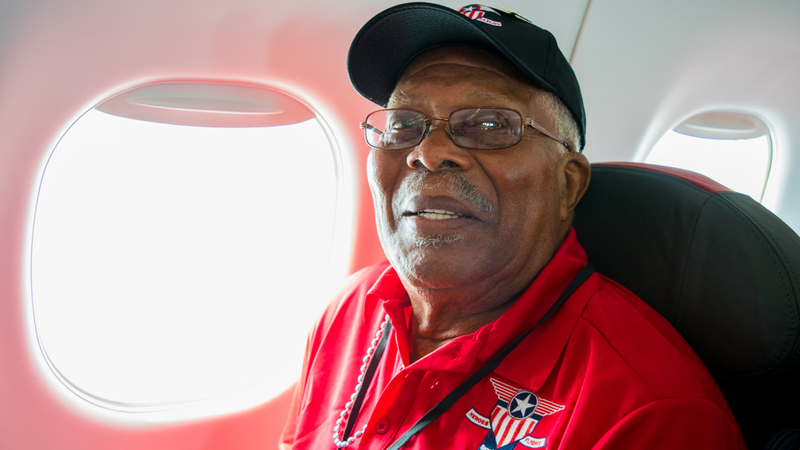 Beginning on May 29, Memorial Day, I joined the Brookshire’s Heroes Flight, which brings U.S. Military Veterans to Washington D.C. for a tour of its many memorials and monuments. As sponsor for the trip, Envoy would be providing volunteers and a chartered flight aboard an Embraer 175 (E175). For three days, I tried to learn more about these heroes’ lives, their history and what the Heroes Flight meant to them. The trip began in Tyler, Texas where I would get my first glimpse of what honor and valor really look like. When we got off the plane in Tyler, Sam Anderson, Brookshire’s Community Involvement Manager, toldus that the ceremony is right outside the terminal. Quickly, we paced through the glass doors and then came to a silent halt upon seeing a congregation of people with their heads bowed in prayer. 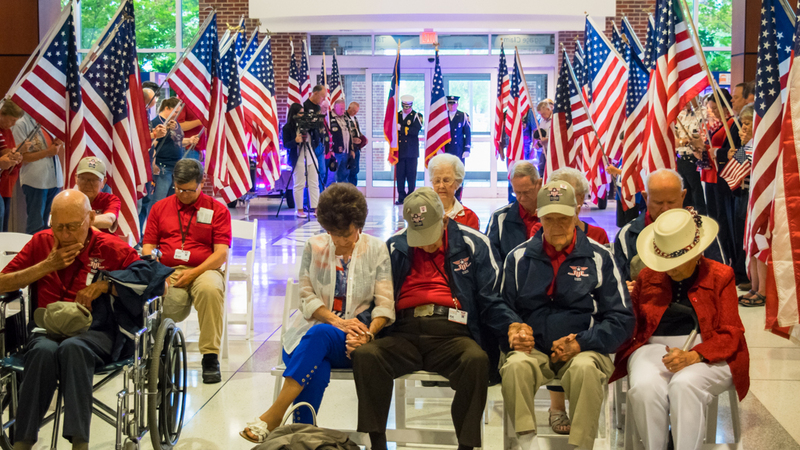 In the center of the lobby surrounded by a wall of stars and stripes, our veterans awaited their journey to the capitol. 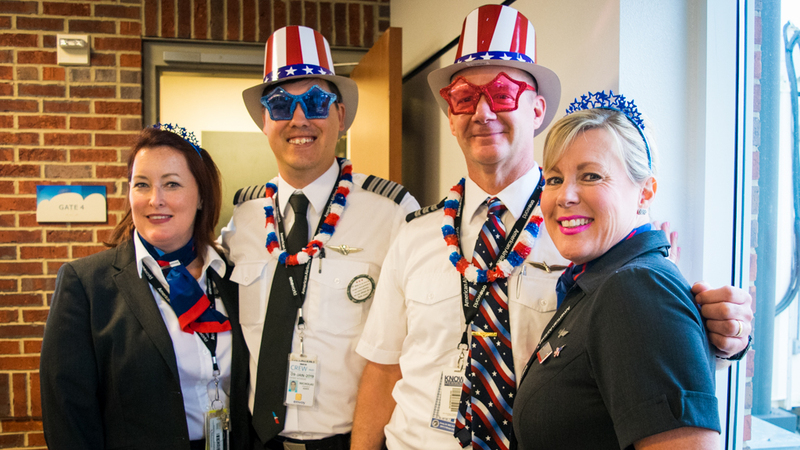 Our Envoy crew for the trip not only operated the flight to and from Washington D.C., but they also went along on the tour to assist in anyway they could. Only Flight Attendant Elizabeth Bustmante (left) had been on a Heroes Flight before, but for Captain Nick Kinner (middle left), First Officer Chris Michaelson (middle right) and Flight Attendant Penny Cumby (right) it was their first time. 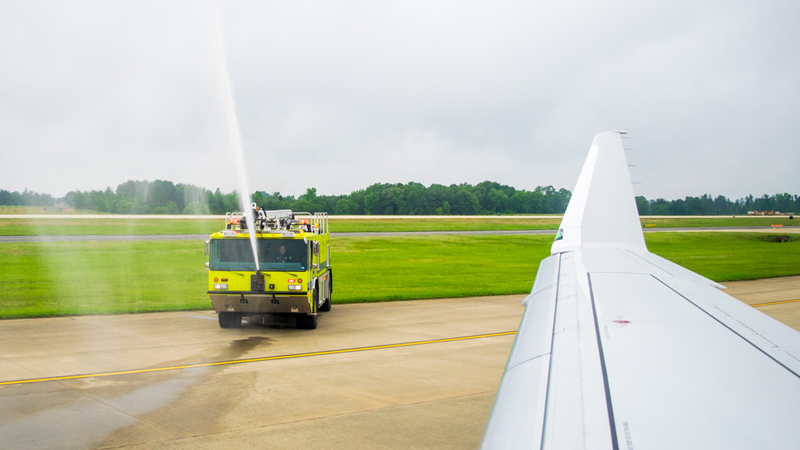 During the taxi to the runway, the airport firefighters showed their appreciation with a water cannon salute. A special occasion calls for something extra. 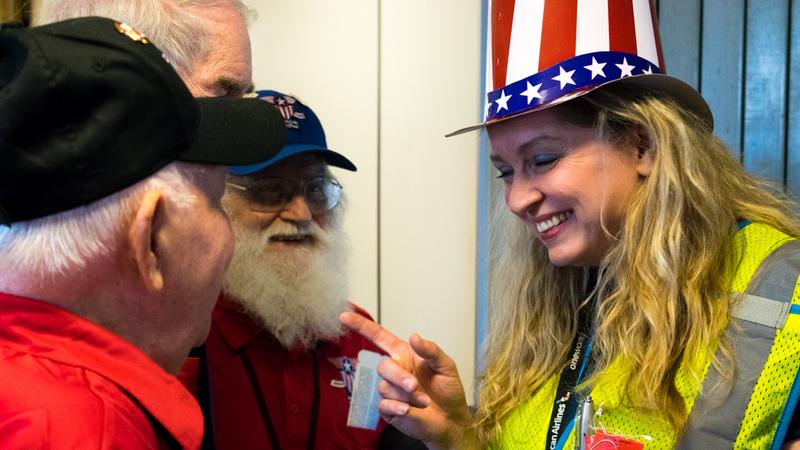 Shreveport General Manager TJ Grosskopf joked with the Shreveport veterans as they board Flight 9560. Like a gang of rowdy teenagers, they bubbled with excitement cracking wise and cutting up. 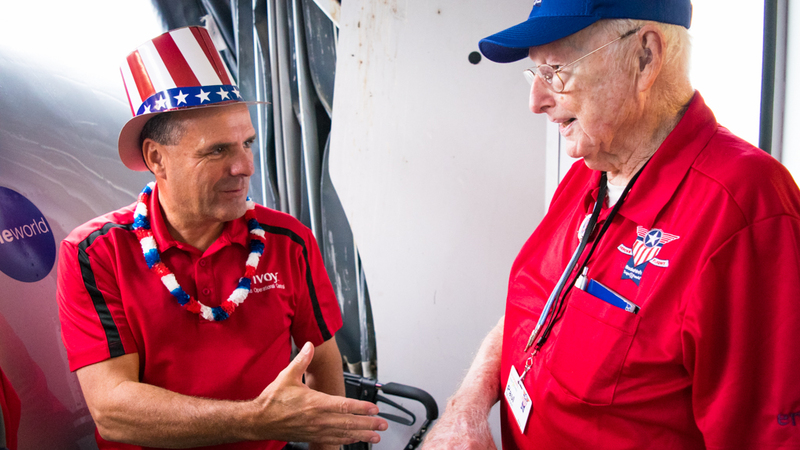 Envoy Director of Systems Operations Control (SOC) Robert Nault greeted a fellow veteran aboard the aircraft with a firm handshake. This is Olan Wise, the most senior member of the trip at 99 years young. He served in the U.S. Air Force during World War II. However, Mr. Wise had never flown on a plane before. “How did you get to war?” I asked assuming he was pulling my chain. “I went to Guam on a boat!” he said laughing. He went on to tell me that on that boat, they were stranded for days in the middle of the Pacific ocean. I asked him if he were scared. “No, we were too young to care. It was exciting!” said Mr. Wise. I asked if he were ready for his first flight. “Shoot yeah, I’m ready! Let’s go!” Mr. Wise exclaimed slapping his knee. At 10 a.m., it was finally time to hit the blue highway to Washington D.C. 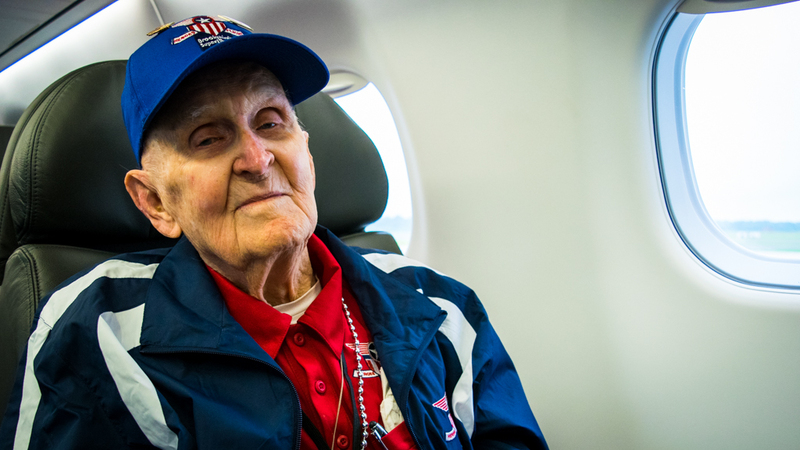 Aboard the spacious E175, veterans like Cleaurthor Sanders bounced in anticipation of the long-awaited trip. Mr. Sanders, a U.S. Marine who fought in the Battle of Saipan during World War II, said that it means a lot to be honored on this trip. He says the last time he was in Washington D.C., he was awarded with a medal. The minute we stepped off the plane at Ronald Reagan National Airport, we were bombarded by a crowd of well-wishers cheering, clapping and eager to shake a veteran’s hand. 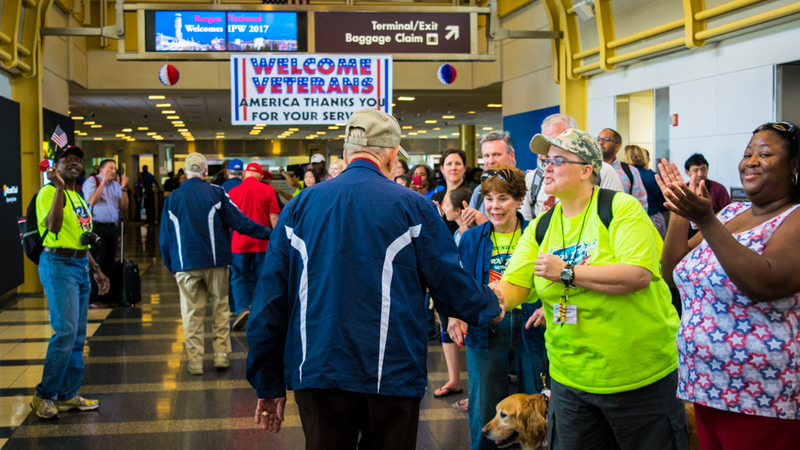 As each veteran walked into the terminal, they were given the rockstar welcome they deserved. 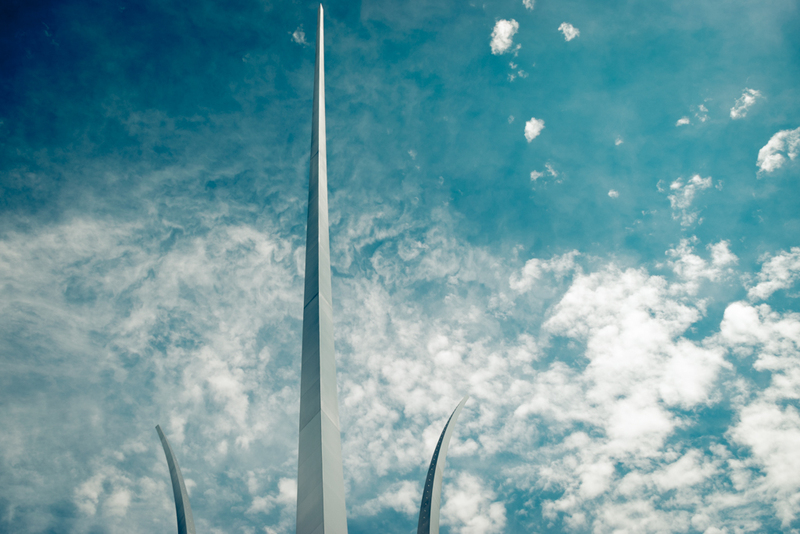 The first memorial we visited was the U.S. Air Force Memorial built in 2006, the newest military memorial in Washington D.C. Three gigantic stainless-steel spires stand in the middle of the memorial symbolizing fighter jets in formation. This was also the first time I witnessed what would become a common occurrence. Everywhere we went, people were drawn to our veterans like paparazzi to an a-list celebrity. While I can understand their humbleness, I still believe that without their sacrifice and commitment our country would not be the same today. 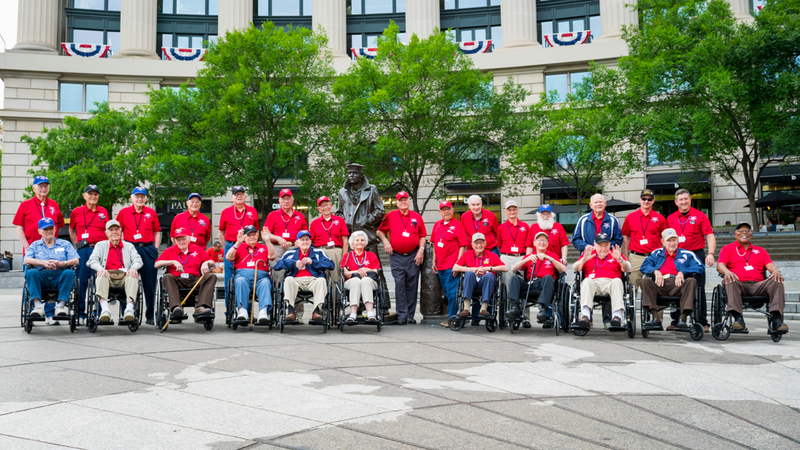 They may be ordinary men and women, but they did extraordinary things for our freedom. 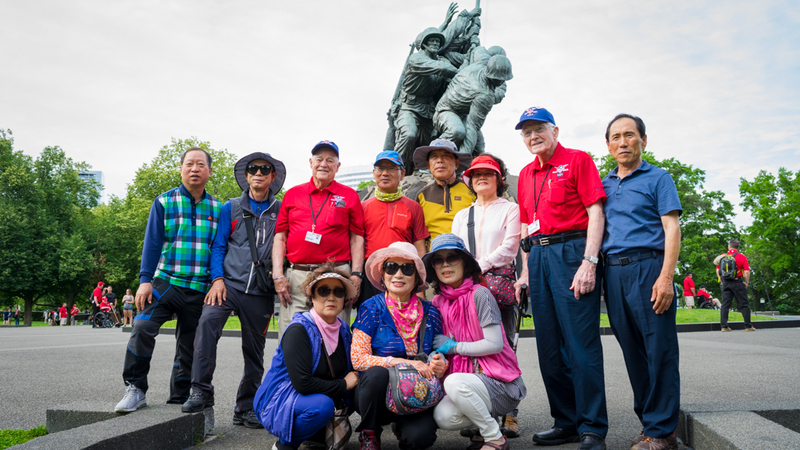 During our visit to the Marine Corps War Memorial, a group of South Korean tourists flocked to a pair of veterans asking them to pose for a photo with them. “Will you take a picture with us? We are from Korea and are honored to meet you,” said one of the tourists to Thurman Smith, the veteran on the right in the photo above. Eventhough these veterans did not serve in the Korean Conflict, the tourists were still honored to meet a U.S. veteran regardless of where they served. The final stop on Memorial Day was to the U.S. Navy Memorial, which featured an expansive flat map of the globe surrounded by dozens of bronze sculptures. Naturally, we decided to take a group photo with one of the statues of a Navy sailor, and we even included two of the volunteers who also served in the Navy (one of them being Envoy’s own First Officer Chris Michaelson). To end the day, the whole lot of us gathered at a Texas barbecue restaurant just blocks from the U.S. Navy Memorial. It was a fantastic ending to a perfect Memorial Day. « Envoy 2016 President’s Award: Meet the Winners!